In many ways Animal Husbandry Today feels like an oddities/antique shop. The 96 pages are filled with accountants, bankers, wet alphabets, and the dead figures of Caravaggio and others. Jamie Sharpe seems referential by nature; meaning is dictated by the items which inhabit the physical world. What plot can be found is often subsequent to someone’s occupation or the year they live in. Accuracy, usually mathematically precise, is another uncommon element Sharpe uses to shape the elements introduced. There are seventeen apples in a tree. A plane crashes on the border of two countries. evergreens, back to tomorrow’s life. The correlations and opposites are interesting and most of the time this setup payoff method works well but other times it can be a little overly simple and I eventually began to expect the last line twists. 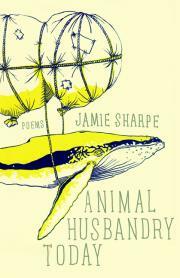 Animal Husbandry Today seems like a book of best of’s or selected poems. (Whether it is or is not I’m not sure.) List poems like Increase Your Web Hits With These Secret Phrases are indicative of the work as a whole. There is an overarching un-similarity from image to image, poem to poem. There is humor in the abstract jumping between dissimilitudes but I got no sense of building to something, or development, as the book progresses. Again though, that is not to say that there aren’t some really good poems in here. There are, and my favorite, Sun Block Days, is tucked in back. Purchase Animal Husbandry Today HERE. Reviewer bio: Wyatt Sparks lives in Chicago. His echap As We All Change is forthcoming in 2013 from Love Symbol Press.